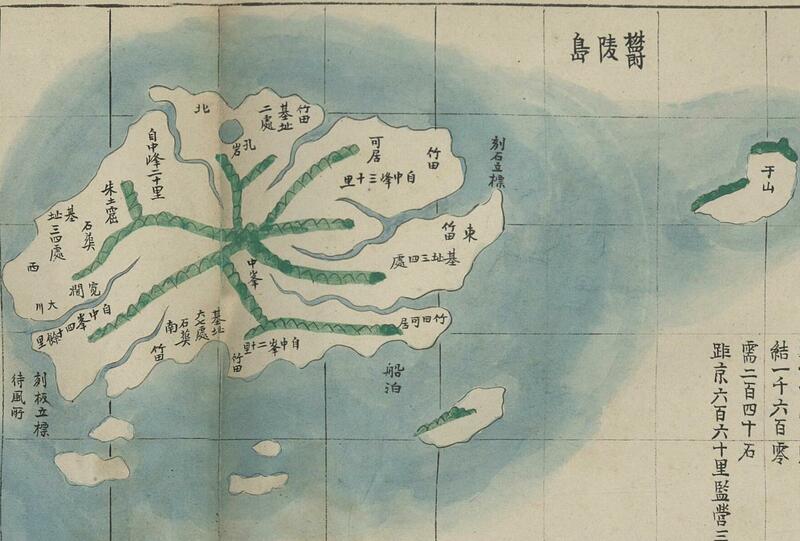 Below are maps of Ulleungdo (鬱陵島) and Samcheok (三陟) from an atlas entitled "Gwandong Pangyeo" (關東方輿), which I believe was made sometime in the late 1800s. The atlas is stored in the National Library of Korea. 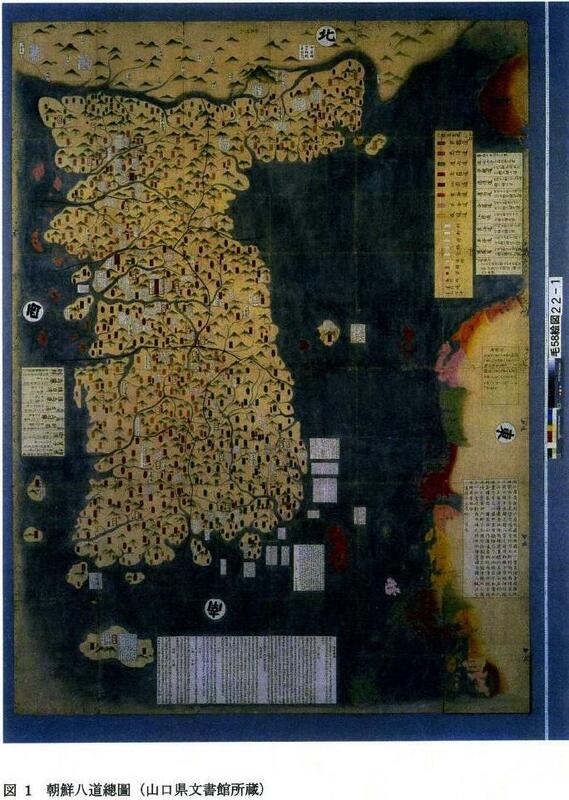 The reason I believe the atlas was made sometime in the late 1800s is that the maps are very similar to the maps that appear in an atlas labeled "地圖" (Maps), which is stored in Korea's Koryo University Musuem. 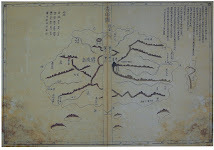 The maps in the Koryo University Museum atlas were made sometime between 1884 and 1994. 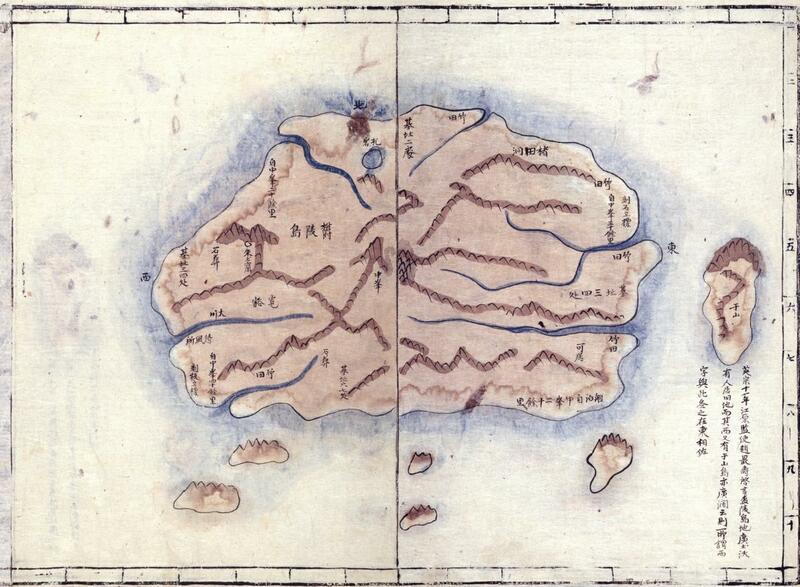 If you look at both sets of maps below, you should notice that Ulleungdo was drawn in a similar way in both sets. Also, notice that both sets of maps used gridlines to show relative distance. 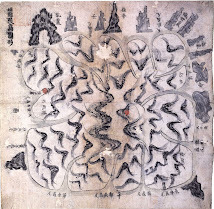 The maps of Samcheok were also drawn in a similar way. 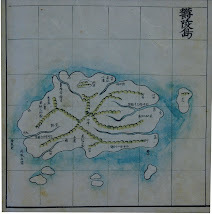 Both sets of maps of Ulleungdo show it with a neighboring island labeled as Usan (于山). 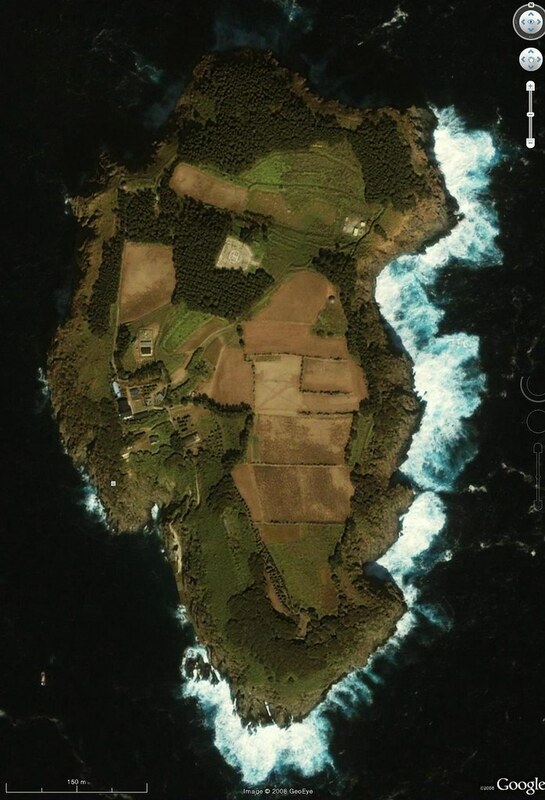 The position of the island suggests that it was almost certainly Ulleungdo's neighboring island of Jukdo (竹島), which is only about two kilometers off Ulleungdo's east shore. 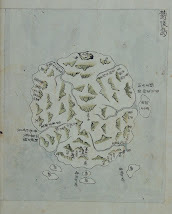 Also, there is an atlas stored in Seoul National University's Kyujanggak Institute of Korean Studies that is also drawn very similar to the other two maps of Ulleungdo shown here, but the people at Kyujanggak entitled "Joseon Jido" (朝鮮地島) that has a map very similar to the two posted here, but the people at Kyujanggak have dated the atlas as having been made sometime between 1750 and 1768, which are dates that I think should be reevaluated considering that we know for sure that the Koryo University Museum map was made after 1884. 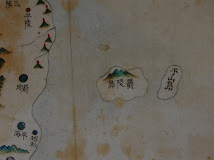 Some Korean historians claim that Usando (于山島) was the old Korean name for Liancourt Rocks (Dokdo), but the maps below and all of Korea's other old maps of Ulleungdo showing Usando prove that claim wrong. In fact, Korea has no old maps showing Liancourt Rocks by any name, nor does Korea have any documents indicating that Koreans traveled to Liancourt Rocks before the Japanese started taking them there on Japanese fishing boats in the early 1900s. Moveover, the few Korean documents that do mention an island that is visible in the distance to the east of Ulleungdo refer to it as if it were Japanese territory. See HERE. 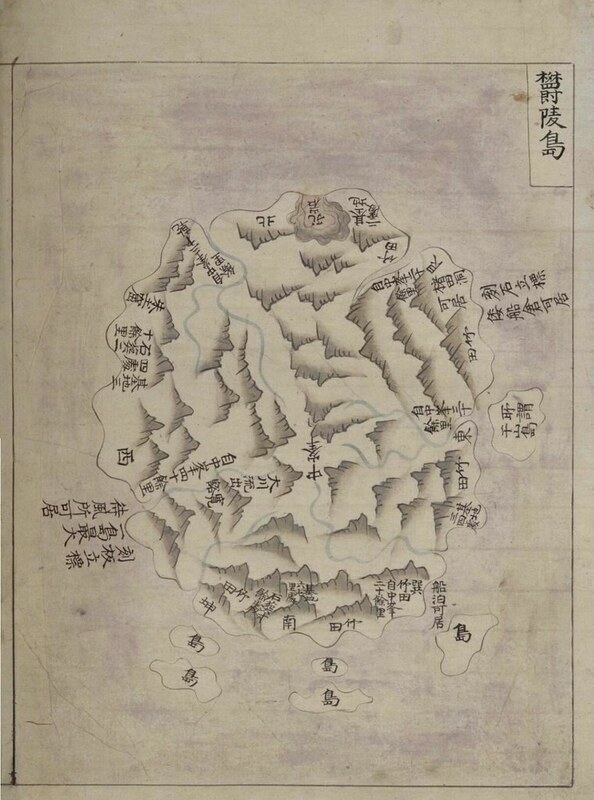 By the way, on the "Gwandong Bangyeo" atlas map of Samcheok (三陟), doesn't it look as if something were erased or covered over in the upper right-hand corner of the map? 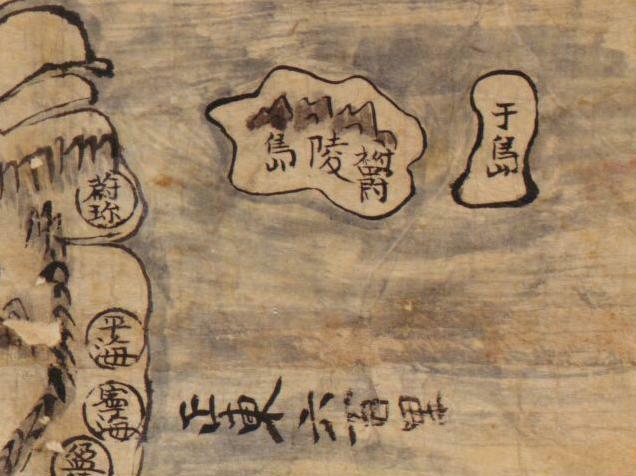 I wonder if there used to be writing similar to the writing that appears on the Koryo University map. 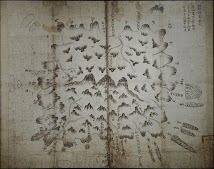 Here is another gridline Ulleungdo map, but the islands were drawn slightly differently from the maps above, which suggests it was drawn at a different time. In fact, the map is believed to have been drawn sometime between 1776 and 1795. 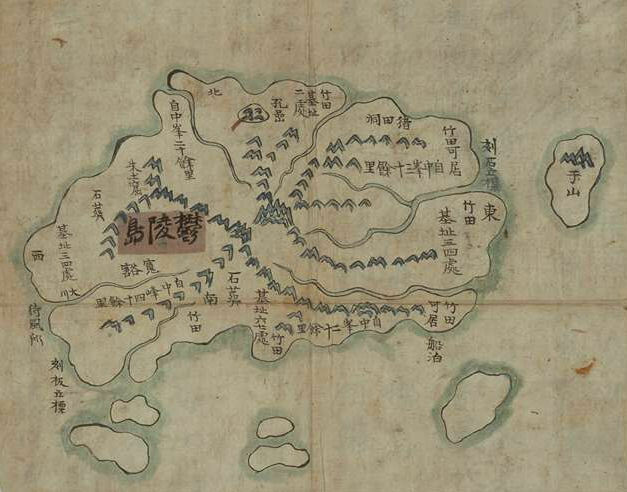 Detailed Ulleungdo map with Gridline is exist on　（late) 18C. You are right, GTOMR. I forgot about the "Haedong Yeojido" (海東輿地圖). It was also a grid map. In fact, I think it was supposed to be the first, but I am not so sure about the dates. The only thing we know for sure about the Haedong Yeojido is that it was made after 1776 because it shows a place in Pyeongan Province labeled as 楚山 (초산). The name was changed from 理山 (이산) to 楚山 (초산) is 1776. See HERE. Also, it shows the following two placenames, 安義(안의) and 山淸(산청), which used to be 安陰(안음) and 山陰(삼음), respectively. They got their new names in 1767. 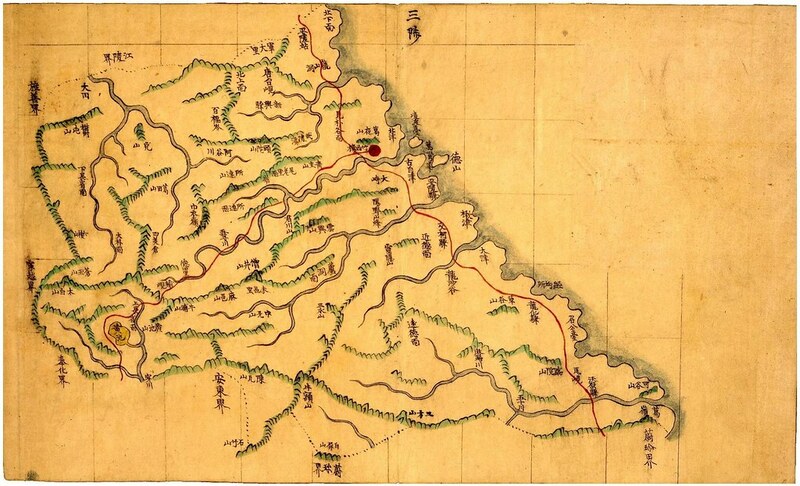 See HEREBecause the map shows 衿川 (금천) instead of 始興 (시흥) in Gyeonggi Province, the map is assumed to have been made before 1795 since the name was changed to 始興 in 1795. (See HERE.) Of course, the mapmaker could have simply overlooked the name change, which would mean the map could have been made later. Anyway, the Ulleungdo map in the Haedong Yeojido was drawn differently from the other three Ulleungdo maps. For example, notice how Usan (于山) was drawn differently. Anyway, I will correct my post. Thanks for pointing out that error. 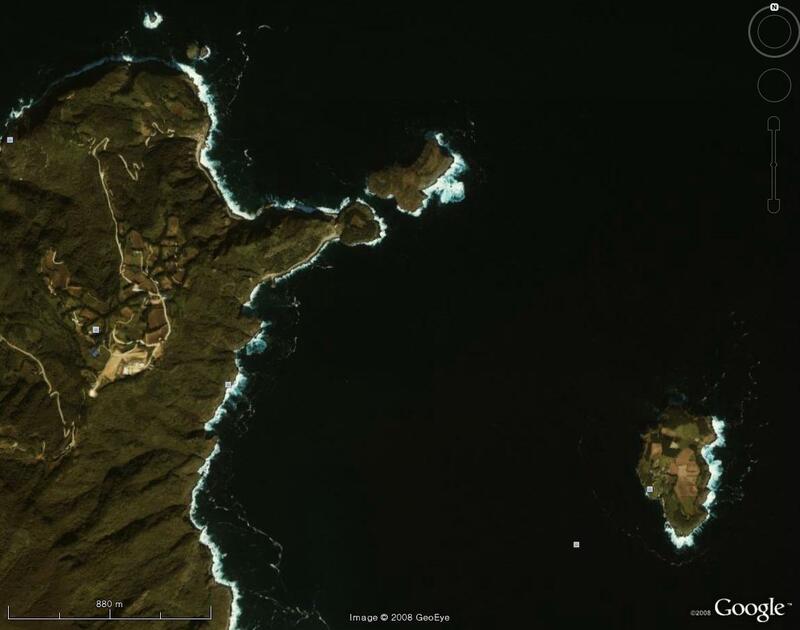 Tiny island to the east of Ulleungdo with Usando in southwest to Ulleungdo? I'd like to see the map. 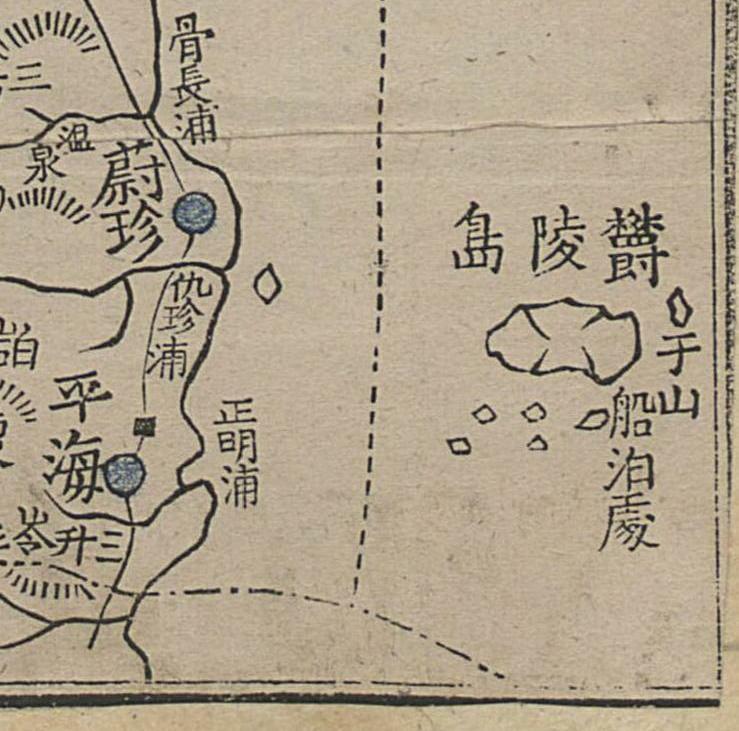 It is interesting that there are many Japan-made Korean maps in Edo era which shows Usando northwest or southwest of Ulleungdo, but no southeast. another interesting old map collection in Tokyo. some of them we can check it web takeshima, but three map cannot confirm which map they refer to. I forgot where the 高橋's article. 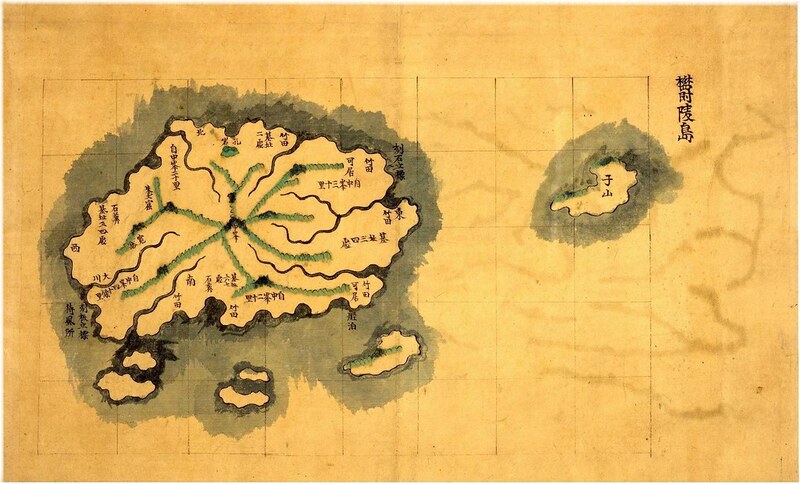 But the Korean peinsula map on his article is traditional-style Joseon design map , not japanese -draw nJapanese/chinese style map like 江戸大節用海内蔵. Also 高橋's survey on 天理大学,there are some map. By the way any1 doesn't know this 2 korean peninsula map in the doccument below? 22-122-2From the map, it is apparent Japanese in Hagi(today's one of Yamaguchi Pref. and next to Shimane) country in mid 1700s considered Usando locates Southwest of Ulleungdo and nearer to Korean peninsula. I think "島" in "地島" (Maps), "Joseon Jido" (朝鮮地島) should be "圖". In the map, the red line (ship line) from Oki to Ulleungdo first goes straight to the “island”, and then goes southwestward to Ulleungdo. That’s why I think it shows Takeshima/Dokto. But still it might be just a “spot”. I hope 山口県文書館 will open clear picture of the map. Zooming up with some trimming analysis, The spot seems some small rocks.But It is difficult to consider the spot is island ,compared with the size of text on Ulluengdo. anyway need to check there. if sending application and go there with camera, they will allow to took photo. But no giveaway service there. 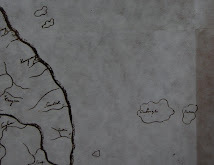 If the spot is island, they would already have announced "we found a map described Liacnourt Rocks is territory of Japan",so I guess it is just a spot or bites. That is an interesting map. See HERE. Is there anyway we can get a closeup of the Ulleungdo area? Do you know what is written in the text box surrounding the small island to the east of Ulleungdo? What else can you tell me about the map? 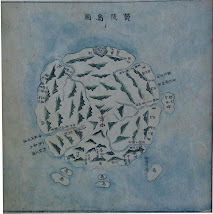 The map is 「朝鮮八道総図」(1742 : 寛保二年) written by Japanese based on the story of castaways from Joseon to 長門国(Nagato Country : part of today's Yamaguchi Prefecture, which is next to Shimane, and it is a prorpety of Yamaguchi Prefectural Archives. Unfortunately, it isn't open to public on the web, so we have to go there to look closely. But Ulleungdo is between Usando and Oki. The other one (「朝鮮八道全図」) is much more interesting since it has red line from Oki through Ulleungdo and Usando to Korean peninsula. I've just borrowed the article of the academic jounals, which has long explanation of the map in detail. I've been scanning all the photocopies matsu kindly lend to me for whole day and haven't really read what it says, yet. I'll read it tomorrow and comment on what the article says. I'll send you articles after I get a permission. I've been talking about this map for the last few weeks if we should post this map or not. But I think we need clearer image of the map and professional opinion, so I am kind of waiting for the Shimane's Web Takeshima Center's study report or at least getting more good images. After reading Prof. Takahashi and Mr. Kawakami's article, it is very possible that they don't realize the importance of this map for the issue of Takeshima, unfortunately. Anyway, below are the summary of the two articles on the maps. The colour map drawn by orders of principal retainer(当職) Yamauchi(山内広通) and Hamazaki prefectural governor (浜崎代官) Shimizu(清水親全). From this port, they set sail to Takeshima. It is said that approximately 150-ris(300km). 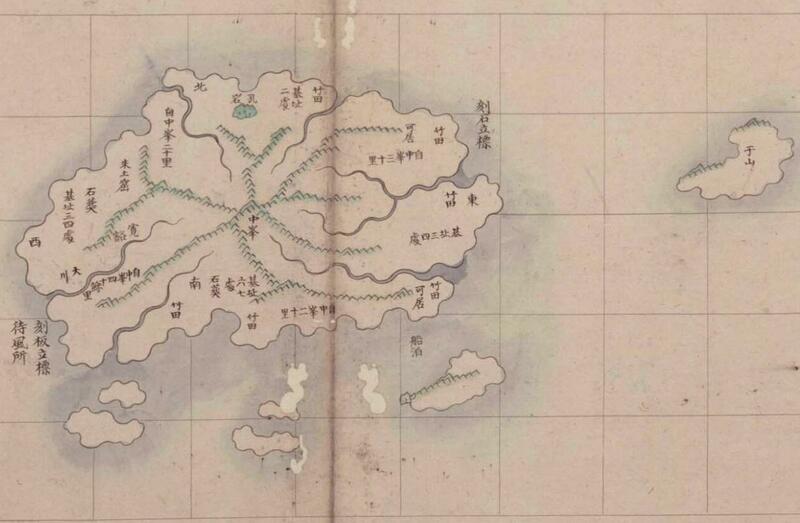 In 1693(元禄六年), a Hohki Country(伯耆国) man, name of Isotake Genzaemon(磯竹源左衛門), declared discovery of Takeshima. And since then, hunters from the countries of Hohki, Izumo and Inaba(伯耆出雲因幡) went for hunting. Howver, Korean also joined. Both parties debated. The information was passed to Edo Bakuhu and Tshushima domain also dealed the matter only to decide the island was Joseon's Ulleungdo. The descriptions on the map are categorized in to four. 1. Geography and the history of each part of Joseon. In the explanation of "Article on Takeshima", Mr.Kawakami noted that "ここでは竹島のことが記されているが、本図の隠岐と鬱陵島の間には現在の竹島は描かれていない。( Although Takeshima was recorded on those maps, today's Takeshima was not drawn between Oki and Ulleungdo. )" And Prof. Takahashi of Nagoya University also wrotean article on this maps. 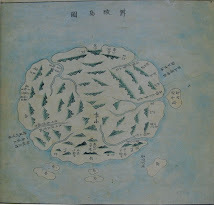 According to his article, the maps are distinctive of Tshushima, which usually drawn as a part of 慶尚道 (in Korean maps) but is drawn as a part of Japan with a different colour from 慶尚道. Two maps are almost the same except for some description. But a clear difference is admitted in the drawing style of the sea area between Oki Islands and Ulleungdo. He commented on the red lines from Oki to Uljin, via Ulleungdo(Takeshima) and Usando. 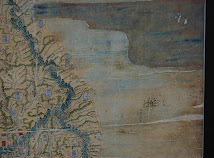 A clear difference (between two maps) is admitted in the drawing style of the sea area between Oki Islands and Ulleungdo. First of all, the common features of the description of the sea area in concren are, in the area of Japanese side, there are many red lines which represent searoutes and two lines are drawn from "宇龍" to "島前(Dozen of Oki)" and "Mihogaseki（美穂関）" to "島後(Dogo of Oki). 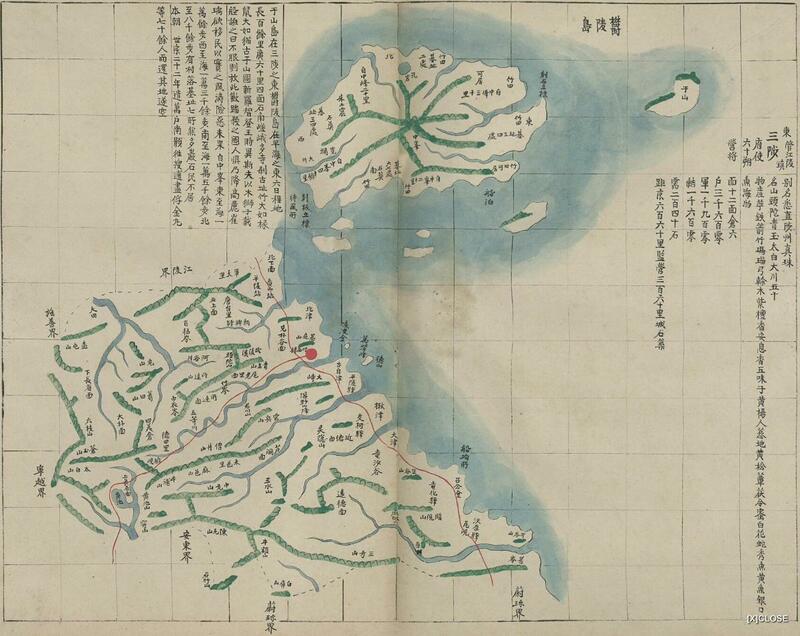 While in the area of Joseon side, almost all red lines are representing land route except for the two lines from Tshushima to Busan Bay and "Uljin Bay(蔚珍浦)" to the west side of "Ulleungdo" via "Usando'. Considring this exceptional expression, it is presumed that the Japanese red lines (or red lines in Japan) streached from Joseon peninsula must have been added when they were made. 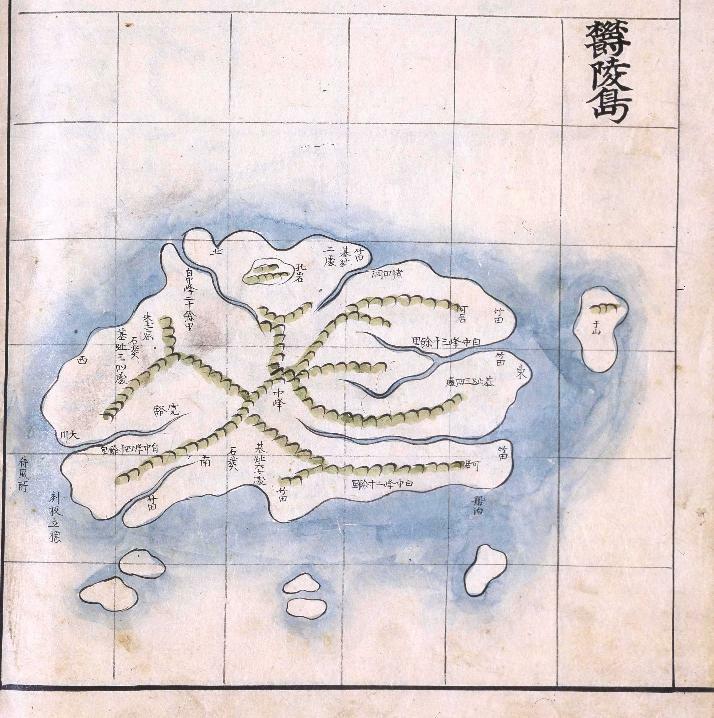 It shows the mapmaker's strong interest for sea routes. As for 「全図」, more profound concern in the sea routes are described. Surprisingly, Dogo in Oki and the east of Ulleungdo was even connected with red line. In other words, the map visualizes the activity of people around this sea area, such as going out fishing from Oki islands to Ulleungdo frequently. This map was accuratly copied from "東国輿地勝覧". Matsubara Seikenn(松原正軒) : interviewed "Korean(韓人)" to get many information of the history and the geography in Korea while staying in Joseon as a official translater of Tsushima clan. Matsubara came to Country of Nagato(長門国 : part of Hagi/Choshu domain) and hired by Mohri clan. 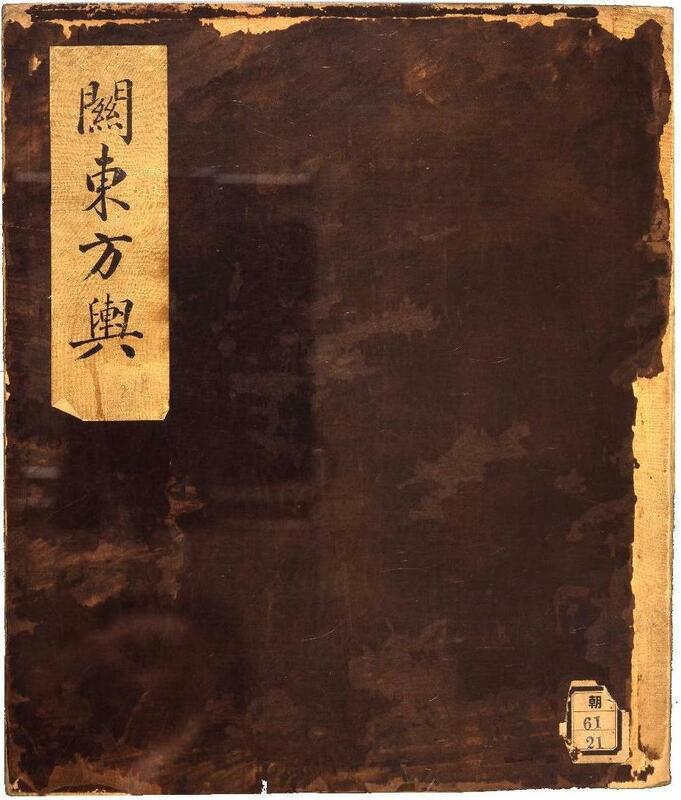 Matsubara's son Siei or Shoei(正英) accuratly copied, by orders of Hamazaki prefectural governor (浜崎の「宰」) Shimizu(清水親全), at the mansion in ship warehouse "舩蔵之館". 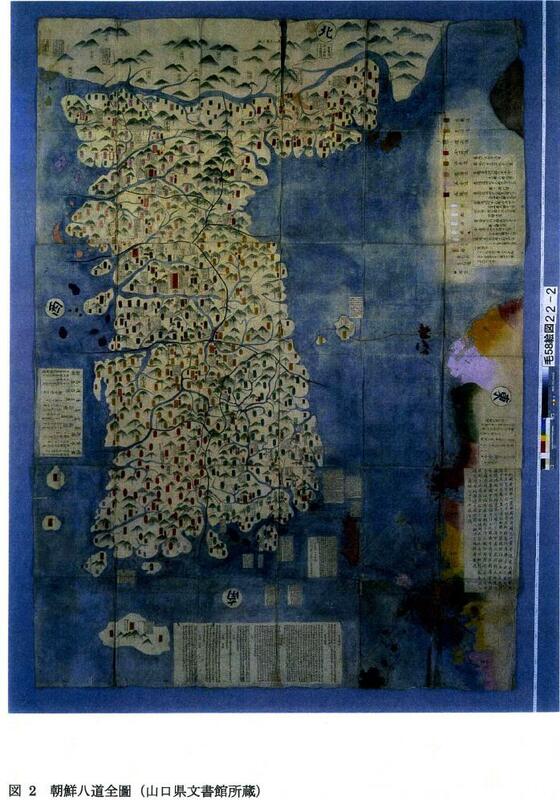 He added "Tsushima, Iki, Goto and the coast of northwest of Kyushu" to use for the reception of the drifted Korean. By the way, Hagi Domain was also called Choshu Domain and people from this domain played the key role in the process of Meiji Reformation, including Ito Hirobumi(伊藤博文). It is interesting for me to get to know that Samurais in Choshu must have known about Usando being placed to the west of Ulleungdo. After reading Prof. Takahashi and Mr. Kawakami's article, it is very possible that they don't realize the importance of this map for the issue of Takeshima, unfortunately. Maybe you could start a post with GTOMR's map HERE, since it is fairly clear, and change the map later when we get a more detailed map? Starting a new post for the map would give us a place to discuss it. I could start the post, but you know more about the map than I do, so I think it would be better if you started it. What do you think? I guess Prof. Takahashi having a clear image of the map? he is in Nagoya Univ. same with prof.Ikeuchi. what about try to contact with him? I dont think Yamaguchi document office will upload images if nobody requested or asked them. also they dont do copy giveaway service so need to go directly by ourselves if need detail clear images. Give me two months. I'm going to Shimane in August, and I'll visit Yamaguchi, too. They have many other documents I'd like to see anyway. Besides, the image I uploaded was from Takahashi's article which matsu sent to me. So I'm not sure we can use this or not on the net. I think it would be better I go myself and ask Yamaguchi Prefectural Archives permission directly. 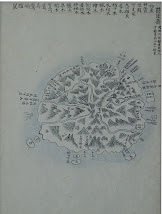 "Both sets of maps of Ulleungdo show it with a neighboring island labeled as Usan (于山). The position of the island suggests that it was almost certainly Ulleungdo's neighboring island of Jukdo (竹島), which is only about two kilometers off Ulleungdo's east shore." Don't you think you need to give more detailed explanation about your bold concluding the island labeled "于山 (Usna)" is 竹島(Jukdo) for the ignorant readers?